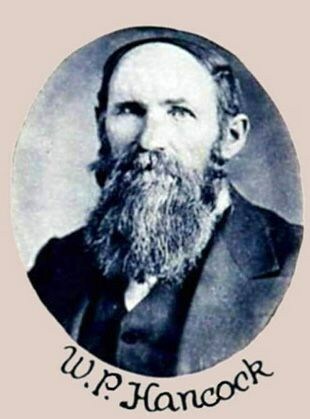 William Hancock was born in Copiah County, Mississippi on June 19, 1833. His parents brought him to Texas when he was thirteen and settled near the town ofJefferson. In 1851, they moved to Bell County near what later became Salado. As a man, Hancock established his homestead near Moffat until he left in 1861 to spend four years fighting in the Civil War. In 1865, he returned and moved to the Salado area where he lived for forty years. After the turn of the century, Hancock lived in Corn Hill, a small town in Williamson County and then in where he remained until 1906 when he moved to Miles near San Angelo. Brother Hancock became a mason at Waco 92 in 1855. He became a member of Salado Lodge in 1872 or ’73. Their lodge minutes burned, so the date is not known exactly. He was twice elected by his Salado peers to serve as Worshipful Master of the Lodge. He also was active in the York Rite bodies of Salado, serving one term as excellent High Priest. In 1860, Hancock began his role as a founding Trustee of Salado College. Peace. He served three years in that capacity and served two years as County Commissioner. He was elected to the 19th legislature to represent Milam, Robertson and Bell Counties and served in both the Texas House of Representatives and as a State Senator. He was appointed State Statistical Agent of the U. S. Dept. of Agriculture under Cleveland’s Administration. He also was a member of the Farmers Alliance at Prairie Dell and served as an officer for that organization more than once. Brother Hancock died on November 19, 1913 and it was said that few men had as much influence on Texas agriculture as him.